"It's my birthday, and I didn't get any presents," he said. 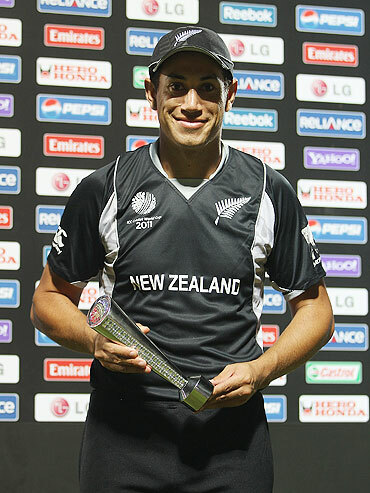 So Ross Taylor, who turned 27 on Tuesday, went ahead and presented himself the best possible gift -- a spectacular century that helped New Zealand to a comfortable 110-run victory over Pakistan in the World Cup match at Pallekele (Kandy). Or was it someone else who gave him not one but two presents? Kamran Akmal dropped the New Zealander twice in three balls -- the first reprieve came when he was yet to score and the second, when he had made just four. And Taylor used his good fortune to make an unbeaten 131 not out, his highest one-day score. "Maybe that was the one (present)," admitted Taylor, acknowledging the contribution of the Pakistani stumper's blemishes towards his innings. "Obviously I had a little bit of luck early on," he said. "The dropped chances did play a crucial role. Thereafter everything seemed to come around for me," he added. Though his innings was a match-winning effort, Taylor wasn't entirely pleased with it. "The first 60 to 70 balls I faced, I thought I struggled," he admitted. "It was only in the last 30 balls or so that I played a lot better," he added. Taylor was, however, happy to have scored his first one-day hundred since October 2008 -- against Bangladesh -- and his fourth overall. "It's been a while since I scored a hundred in an ODI. I have scored a few sixties but couldn't carry on," the Kiwi opener said. New Zealand skipper Daniel Vettori had on the eve of the match justified Taylor's presence in the side despite not contributing much in recent times -- the latter had registered just one 50-plus score in his last 14 one-dayers -- and had expected he would fire on Tuesday. "Ross is definitely one of our best players, if not the best batsman," Vettori had said, adding, "He likes to take the responsibility on himself and performs when he is in form. "I expect him to win a game for us at some stage of the tournament. And hopefully it is tomorrow." Taylor was more than happy to justify his captain's faith. "The fact that I haven't been in form in the recent times has been well documented at home," he said. "I have been very frustrated myself. But I was trying hard all the while and today I have succeeded," he added. Taylor plundered 28 runs Shoaib Akhtar's ninth over -- the 47th of the innings -- and a further 30 runs in Abdul Razzaq's fourth over -- the 49th of the innings. Against Shoaib's pace he hit two boundaries and three maximums and against Razzaq, he hit twice to the fence and twice over it. Thanks to his flamboyant batting, New Zealand plundered 92 runs in the last four overs. So how he did he manage to hit Shoaib so many times out of the ground? "It was a shorter boundary to that side and that helped," explained Taylor, modesty personified. And he was equally surprised at managing to take his team's total beyond the 300-run mark. "We needed to get to a competitive total to give ourselves a chance," he said. "We were trying to get to 250-260 but a 300-plus score was unbelievable, he added. Unbelievable it was. But not as much as Taylor's magnificent hundred. Or shall we say his lovely birthday gift.